The Upadesamrta with the illuminations of Srila Sridhara Maharaja has been printed and this is a very befitting day for this book to come out. The front cover has a picture of Rupa Gosvami's samadhi, and on the back there is a picture of Radha-kunda. Rupa Gosvami and Radha-kunda – these things are deeply connected from the plane of Krsna consciousness in Goloka Vrndavana. Mahaprabhu considered Radha-kunda to be non-different from Radharani. So the question may arise, how should we deal with Radha-kunda? The answer is – the same way we would deal with Radharani. How would you deal with Radharani in the temple? How are we dealing with Radharani? If you are a pujari you have some dealings with Radharani. Then, the rest of us – what dealings do we have with Radharani? The answer is pretty obvious – through Sri Guru and the Vaisnavas. These are paramount to our dealings with Radharani. Radha and Krsna are present in the form of the Deity. There we have the opportunity to perform personal service – dressing, bathing, offering food, flower garlands, scented oils etc. But they stand very still and sometimes they do not change their look. But we should not think that it is idol worship. Idol worship means where there is no life. Nowadays in modern Hinduism, even temple pujaris have become accustomed to call the Deity ‘the idol’. They'll happily tell you which ‘idol’ they are worshiping at the temple. The very definition of the word ‘idol’ means a form of a god, but it is lifeless. No life is there. The sri-murti, the Deity, is never lifeless. It is always full of life – Krsna life. Otherwise it is not a murti. It is only a statue. Then it might be considered to be an idol. When does a Deity become an idol? Can a Deity become an idol? Yes it can. When those who worship the Deity fail to respect the devotees, then at that point Deity worship becomes idol worship. This means that Krsna is no longer present and that poor fellow is simply worshiping a lifeless statue. Abhirama Thakura was an associate of Lord Nityananda. Sometimes he would go to a temple to take darsana and when he would prostrate himself before the deity, if Krsna was not there, then the deity would just explode into pieces and fall on the floor. It was a serious thing if Abhirama Thakura was coming to your temple for darsana! Now why would that happen? Because people sometimes keep a statue of Krsna for the sake of collecting money from innocent people who have no discrimination about who is a Vaisnava, what is a proper Deity etc. They are simply roaming and searching for Krsna blindfolded. Why did the deity break? Was it Abhirama Thakura’s power? No – it was Krsna’s power! Krsna's potency could not tolerate a pure devotee bowing down before a lifeless statue, even of Krsna. Once, Abhirama Thakura offered his obeisances to the sons of Nityananda Prabhu and they had all died except for Vircandra Gosvami. If Abhirama Thakura offered obeisance and that person was not actually a Vaisnava then they would die. Generally, false Vaisnavas avoided Abhirama Thakura. If the news came that Abhirama Thakura had come to the village for some purpose, all the false Vaisnavas would leave to visit their aunty in some other place! One day Abhirama Thakura was coming to Puri to have darsana of Mahaprabhu. At that time there was also a young boy named Gopala-Guru. During Mahaprabhu’s time Gopala was a young boy, but later he grew up and was the leader of many Vaisnavas. On this occasion he found himself between Mahaprabhu, who was in His room and Abhirama Thakura who was coming down the hallway. Gopala was so frightened that he turned around, ran back and jumped onto Mahaprabhu's lap, wrapping his arms around Mahaprabhu's neck. He understood that he would be safe there, because if Abhirama Thakura offered obeisance in that direction, Mahaprabhu would protect him. He thought of himself as not being a real Vaisnava. That type of thinking is only found in a true Vaisnava. To think of ones self as the least qualified is the actual qualification of the most qualified. But we can't artificially do that. The tendency is there that once we hear that the most qualified are the ones that feel the most unqualified then we start saying, “No, I'm not qualified prabhu!” But just get a hold of yourself! You are trying to imitate the highest devotee. You can't just say, "I'm not qualified!" Words without meaning and without feeling are best not spoken. What is our path to become a real Vaisnava? Not in the sense of becoming the highest Vaisnava – no one should think like that. But we do aspire to become a real Vaisnava. Why did we join Krsna consciousness? It is not unfair or improper to aspire to become pure. Otherwise why are we here? We aspire not just to become devotees of Krsna, but we aspire to become pure devotees of Krsna. We do not aspire to become mixed devotees. What do we aspire for? We know that only pure devotion pleases Krsna, so we aspire for pure devotion. Devotees are always cautious to offer their food to Krsna first in their house and especially in their temple or asrama. Sometimes, in the course of life's duties and journey a devotee may have to eat outside, in someone else's house or sometimes in a restaurant while traveling. But a devotee doesn't like to eat in a restaurant. If someone says there will be prasadam in a half an hour; then he doesn't say, "Hey, why don't we go to the Pizza Hut tonight instead!" This is what happens amongst the non-devotees. It happens all over the world all the time. Restaurants are huge in big cities. People skip cooking and go to a restaurant. We never skip prasadam in a favour of eating in a restaurant! Of course, someone may go and eat in a Govinda's Restaurant, but even then, it is better you take prasadam in a temple and stay away from the Govinda's Restaurant also. In the beginning, Govinda's Restaurant was off limits to the devotees. Prabhupada never allowed devotees to go to Govinda's Restaurant. When there is a temple prasadam why you want to go to the restaurant? Therefore it is said that devotees do not like to eat in restaurants, but sometimes they may have to. There lies the ultimate principle – always remember Krsna and never forget Him. In any circumstance outside of the ideal circumstance, we remember Krsna and mentally offer everything to Him. But in the temple we can bring that remembrance into shopping, cooking, cleaning etc. for Krsna. But outside, it takes a little bit more to keep that in focus. The first thing that Rupa Gosvami outlines in Upadesamrta is self-control, and the first aspect of self-control is in relation to what you eat and what you speak. You must train yourself to take krsna-prasadam and train yourself to speak about Krsna, to chant Krsna's Names and that also mean to speak with Krsna's devotees. That generally means speaking about Krsna. So self-control begins with controlling our speech and our eating, then Rupa Gosvami explains about controlling the other senses. Through eleven simple verses he takes us all the way to the highest conceptions within the service of Radharani in Vraja. It is not that we will always be on level one, but we should definitely concern ourselves with level one if we want to get to level two. Once we are at level two it's only nine more stages till the eleventh stage and things become very sweet even before that. But if we do not follow that, then we won't even get to level two, nor to the third step, the fourth step and so on. Why we are observing my appearance day today? Actually I came late from Mexico, so Giri Maharaja and Madhava Maharaja thought it was a good idea to observe it on Radhastami because ultimately our guru represents the service of Krsna, and the service of Krsna is the domain of Radharani. 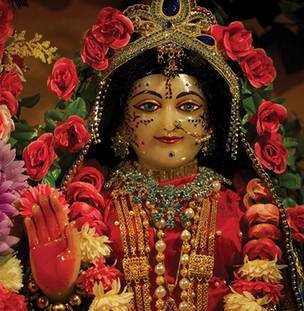 She is Bhakti-devi, therefore our guru represents Srimati Radharani. Although the ultimate representation of guru is that he represents Srimati Radharani, still, we are not to deal with him in that exact way. Similarly we know that as Rupa-manjari, Rupa Gosvami is one of the closest associates of Radharani in the spiritual world. But we are not to deal with him as Rupa-manjari – we are to deal with him as Rupa Gosvami. The other side is there and that is waiting in eternity. If you can't deal with him properly on this side as a Gosvami, then how will you deal with him on that side as a manjari? That is not possible. You first have to deal with the saints here on this side properly – not skip over that and just try to imagine you have a connection far, far away in the land of Goloka Vrndavana. Once, during the time before we had emails, somebody wrote me a long letter. It was handwritten on graph paper with all these little squares and I thought, "This is madness. Did this come from a lunatic asylum?" It didn't – it came from a godsister. The first few pages she was asking about meditation – “Can this meditation on Prabhupada be performed?” The first part of the meditation was that Prabhupada has come from his morning walk and into the temple. We hand him some flowers and he sits on a Vyasasana and we offer him garlands. Then, at a certain point, it changed. His dhoti shifted to another color and all of the sudden he was being meditated on as being a gopi or a manjari. It went on and on with all of these types of things. I wrote back and said, “Up to this page it is fine because you really used to offer Prabhupada a flower and you really did used to give him a flower garland and you really did wash his feet etc. All these things really happened and you can meditate on that if you want. That is called smaranam. But everything else after that is a total speculation. It never happened. You are taking this into a realm where you have no assurance whatsoever. You should simply understand that our gurudeva has an intimate connection with Radharani and is Her representative here. It's very similar with Krsna also. When Srila Sridhara Maharaja was asked something about krsna-lila he laughed and said, “That is for the next life, that is rather a dreamy thing." We are to concern ourselves with sankirtana and Mahaprabhu. Service to Mahaprabhu is more important and there is no service of Mahaprabhu without serving the devotees. It is said that rather than trying to approach Krsna and Radharani directly, you just approach the service of Mahaprabhu. Accept the service of Mahaprabhu and worship Mahaprabhu's lotus feet and one fine day you'll wake up and you will find that you are fully absorbed in the service of Radha-Govinda. You don't even have to make a separate endeavor. This is a great secret within Gaudiya Vaisavism. Everything comes to the devotee who fully surrenders at Mahaprabhu's lotus feet. But, if you simply try to surrender directly to Krsna, you will have problems. That is the most difficult thing to do. Even if you succeed it is not complete. Then Krsna Himself says, “Now that you have done that, you have to go to this department.” He is not the ultimate department. But when you come to Mahaprabhu, you are dealing with the ultimate department - that is called audarya. Audarya is a notch above madhurya. Audarya means madhurya with magnanimity. Krsna-lila is called madhurya-lila – the sweetest. But Mahaprabhu's lila is called audarya-lila and audarya means the sweetest rasa with magnanimity. Magnanimity is something we all need. We need that magnanimity because we are very, very small. We do not have such a capacity to serve Krsna without magnanimity. Magnanimity means divine grace, with Krsna's divine grace. Can you go to the sun to warm yourself? No – the sun comes to us. We cannot go to the sun, but Krsna can come to us. This is given in physics – the possibility of the positive and the negative. Krsna is the positive and we are to act like the negative and the positive will be attracted towards us. Otherwise we cannot reach the positive. The greatest negative it is said to be Radharani. She is the greatest negative and Krsna is totally attracted to Radharani. The reason that Krsna left the rasa-dance was to search for Radharani. There were millions of gopis dancing with Krsna and one of them was Radharani. Suddenly She disappeared and Krsna immediately lost interest in the rasa-dance. It was all dry. He had no more focus, millions of gopis were dancing there but Krsna lost His focus because Radharani was gone. We are always told that just as the hand serves the body and as a servant serves the master, we are a part of Krsna and we are meant to please Krsna. But after reading this pastime I suddenly realized, "If millions of gopis could not please Krsna, then what chance do any of us have? How can you, or I, or any of us directly please Krsna when millions of gopis together could not please Him? That is a fact. Therefore, we must please Krsna's dearmost, and the dearmost of Krsna is Radharani. Thus, in Gaudiya Vaisnavism, we are devotees of Radharani first, and second we are devotees of Krsna – but we don’t advertise this to the public. Then the pandita explained, “No, they are suddha Saktas because foremost they are devotees of Krsna's consort - Radha." He was a man who had done a deep study of Gaudiya Vaisnavism. Now we are Gaudiya Vaisnavas – should we be like the Sri Vaisnavas who didn’t know that Buddha is actually included in the dasavatara? In other words, should we be the kind of Gaudiya Vaisnava who doesn't understand the depth of Gaudiya Vaisnavism? About ten years ago, one of our devotees went to some village for a special program on Sivaratri. When he came back and I asked him, “How was your program?" He said: “They were worshiping Siva and I told them how in Vrndavana Siva becomes Gopesvara." 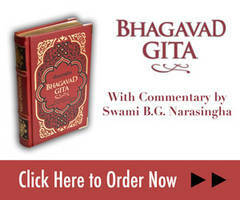 Look what Srila Prabhupada did for the world with Bhagavad-gita. Scholars lined up during his time to give appreciation for the Bhagavad-gita. The world is suffering due to lack of knowledge of how to live in this world and why are we in this world? They are not suffering due to a lack of deep knowledge concerning the other world. That does not concern them - it doesn't concern most of us! We are to explain the knowledge that we are not this body, how all living entities are servants of Krsna, and how the Holy Name is non-different than Krsna. Actually we say that the Maha-mantra is non-different than Krsna, but half of the Maha-mantra is the name of Radharani also. We should know that we are dealing not only with Krsna, but with Radha-Krsna. But when we go into the world to preach, we leave Radharani in the background. We do not come to the front with Radharani. When he narrated the Srimad Bhagavatam, Sukadeva Gosvami wasn't just sitting with a bunch of village drunkards. He was sitting there with many rsis and sages and Maharaja Pariksit himself. He kept the Name of Radharani in the background. Even when it came to that part of the Bhagavatam when he could have introduced Radharani, he hesitated to tell these people about those secrets. He told it in a peculiar, hidden way. He never directly told the Name of Radha even once in Srimad Bhagavatam. It’s not there. They were many great rsis there, but who were they? Many of them were Brahmavadis and yogis with mystic powers and all types of philosophers. But none of these things qualify one for vraja-bhakti. He did not want to do them any harm. If the highest thing goes to those who are not qualified, it will not do them more harm than good. It is like bee-pollen. In western countries farmers harvest pollen from the bees and it's very high in vitamins. You can buy this and it is very tasty, but if you take too much of it, you will get diarrhea. It is a good thing, but too much of a good thing can make you sick. That is common with anything – milk is also good, but drink too much and it'll give you loose motion. So this high, high topic does not look good in the small ears of the common people. Or, as Srila Bhaktisiddhanta Sarasvati Thakura used to say: "This high topic does not look good in your small mouth." Concern yourself with the necessity of your present status. Do not try to go beyond. You have to go step by step. Upadesamrta takes us step by step and Srila Sridhara Maharaja’s illuminations are very wonderful and very assuring. We must go step by step and with much caution as we approach the ultimate goal.